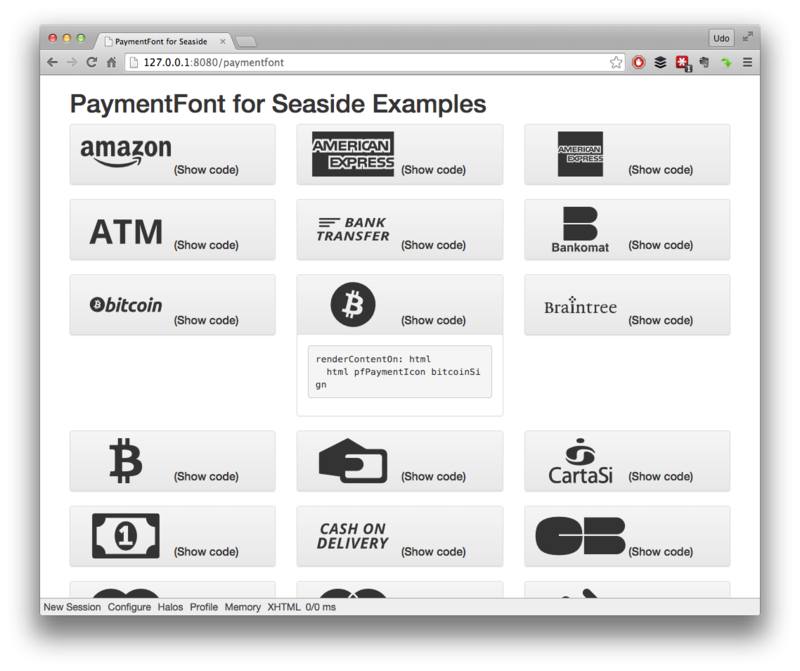 The “PaymentFont for Seaside” project is a small Seaside wrapper for the PaymentFont project. FontPayment is a “sleek SVG webfont containing 74 icons of all main payment operators and methods”. PaymentFont is licensed under SIL OFL 1.1. The CSS files are licensed under the MIT License. The Pharo Smalltalk wrapper code is under MIT License. ((Smalltalk at: #ConfigurationOfPaymentFont) project stableVersion) load. To add PaymentFont to your Seaside application you just have to add the appropriate seaside file libraries containing the CSS and fonts to your Seaside application. Depending on the scenario there is a PFDeploymentLibrary and a PFDevelopmentLibrary that you will find in the package PaymentFont-Core in the category PaymentFont-Core-Libraries. Have a look at the #register method in the PFExamplesHome class for an example. The package comes with 74 tests in the package PaymentFont-Tests. Just use the SUnit TestRunner to run them.